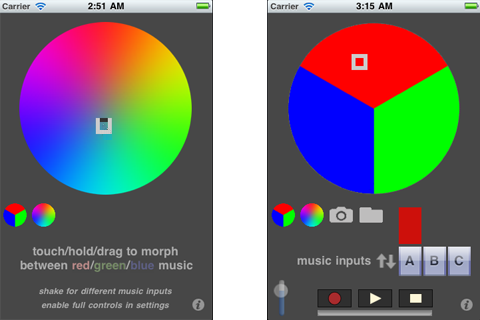 iPhone app from Tone Unit for real-time music morphing via a color interface. iPhone musical instrument that produces a riff for each shake of the phone, in harmony with the currently selected audio loop. Initial pitch (scale step) is controlled by the angle of the phone. Timbre (audio sample) is controlled by acceleration. Musical instrument that produces a note for each shake of the phone, within a selected musical scale. Pitch (scale step) is controlled by the angle of the phone. Timbre (audio sample) is controlled by acceleration.